Here's a short list of words and phrases that have special meanings in the Lords of Waterdeep game. action space: Each Building has one or more action spaces to which players assign their Agents. When you assign an Agent to an action space, you immediately take the specified action. active Quest: All face-up Quests in front of a player that the player has not yet completed are active Quests. adventurer: You complete Quests by taking the required Adventurers from your Tavern. There are four kinds of Adventurers, represented by wooden cubes: Clerics, Fighters, Rogues, and Wizards. agent: You assign your Agents to action spaces of Buildings to use their effects. ambassador: A special Agent that you can use by assigning an Agent to the Palace of Waterdeep. assign: You assign an Agent by placing it on an Building's action space. attack: A kind of Intrigue card that harms other players. building/building tile: The game board contains nine basic Buildings, and players can purchase other Building tiles and put them into play. Buildings contain action spaces to which Agents are assigned. gold: You spend Gold to purchase Buildings, complete certain Quests, and pay for other game effects. intrigue card: You draw an Intrigue card by assigning an Agent to Castle Waterdeep. (Other game effects also allow you to draw Intrigue cards). You play an Intrigue card by assigning an Agent to Waterdeep Harbor. lieutenant: A special Agent that you add to your pool by completing the Recruit Lieutenant Quest. 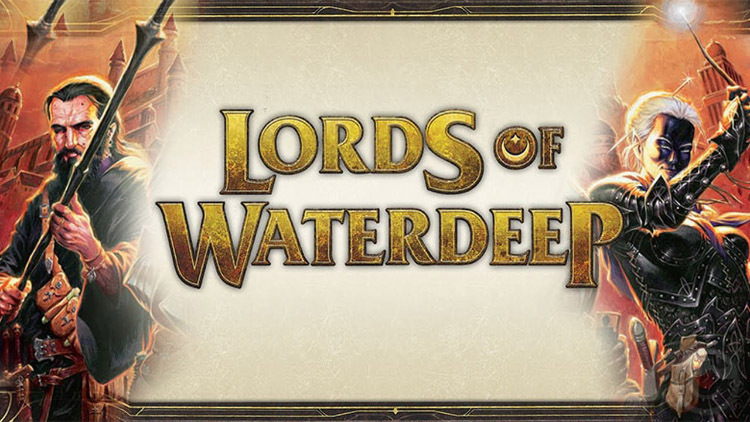 lord card: Each player takes the role of a Lord of Waterdeep, represented by a Lord card. The Lord's identity remains secret until the end of the game. Each Lord card grants bonus VP for accomplishing certain tasks. mandatory quest: A kind of Intrigue card that forces another player to complete a minor but pressing Quest before any others. occupied/unoccupied: A space that has an Agent assigned to it is occupied. You cannot normally assign another Agent to an occupied space. You must choose an unoccupied space (one that contains no other Agents). plot quest: A kind of Quest that provides an ongoing benefit as well as a reward. pool: The area where you keep your unassigned Agents. At the end of the round, all your Agents return to your pool. quest: You complete Quests to score Victory Points and to earn other rewards during the game. quest card: These cards represent Quests that players complete to score VP and earn other rewards. At the start of the game, there are 4 face-up Quest cards in Cliffwatch Inn, which players can take by assigning Agents to that Building. More Quests enter play as the game progresses. reassign: After all Agents have been assigned in a round, any Agents that were assigned to Waterdeep Harbor are removed and assigned to any unoccupied action spaces. reward: Upon completing a Quest, you earn the reward specified on the card. Quest rewards usually include VP and can also include other benefits. You earn the reward immediately and only once. round: The game is played over eight rounds. During each round, players take turns assigning their Agents to action spaces on the game board and completing Quests. supply: The supply contains Adventurers, Gold, and VP tokens available to players. tavern: This area holds the Adventurers you have hired until you use them to complete Quests. You also store Gold in your Tavern. turn: During each round, players take turns. Whoever has the First Player marker goes first, then the player to his or her left, and so on. During your turn, you assign an Agent to an action space and may complete a Quest. utility: A kind of Intrigue card that helps you. victory Points (VP): You score Victory Points primarily by completing Quests. Other game effects can also provide VP.